"Muy contenta con todos los productos, tanto por su calidad así como su..."
Unakite chips strands. Each strand measures about 80 cm and contains about 260 chips of unakite. 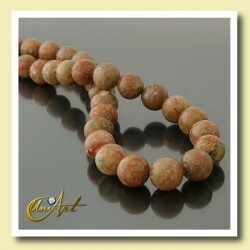 10 mm Round beads of Unakite. String with about 40 cm in length. Each string contains 39 balls and weighs 55 gr. approximately.